Chief Minister Virbhadra Singh has said undue delay in 132 kv substation at Gaura in Kandaghat will be probed. The substation was supposed to provide dedicated power supply to the Giri Potable Water scheme. The state government has decided to construct Bachat Bhawan at Tehsil Chowk here at a cost of Rs 6 crore, funds for which will be released soon. Urban Development Minister Sudhir Sharma today said the Bachat Bhawan project with a parking lot, shopping complex, coffee house and an auditorium, besides a commercial accommodation at the top of the building, would come up. Chief Minister Virbhadra Singh today said the congestion in the IGMC, Shimla, would soon be eased as the government had identified 165 bighas of land on the outskirts of the city where both dental and nursing college would be built. Addressing delegates of the 13th annual HP State Dental Conference organised by the state chapter of the Indian Dental Association (IDA) here, he said dentistry had emerged a new medicinal science and a specialised service. He said the state government was committed to improving the health services and had opened many institutions in the remote areas where placement of doctors was being ensured. Telestroke projects, started by Himachal under the technical guidance of All-India Institute of Medical Sciences (AIIMS),Delhi, is proving to be a big life saver for many stroke patients in remote areas with the facility to treat it being made available at 19 hospitals besides two government medical colleges. It was considering not just the high mortality rate of stroke, but even its morbidity that the telestroke project was launched in Himachal in April earlier this year. CSK HP Agriculture University celebrated its foundation day here today. Dr KK Katoch, Vice-Chancellor (VC), while addressing university officials, students, teaching and non-teaching staff, recalled the contributions of former vice-chancellors and other staff towards the development of the institution in the past 36 years. A national seminar on the emerging problems of potato was organised jointly by the Indian Potato Association and the Central Potato Research Institute (CPRI) at the CPRI here today. It was inaugurated by Governor Urmila Singh. In her address, Urmila Singh urged scientists to develop disease-free seed varieties for farmers in the country to achieve the potato production target of 150 million metric tonnes by 2050. The Chief Judicial Magistrate (CJM) today adjourned the defamation cases filed by Chief Minister Virbhadra Singh against former chief minister PK Dhumal and his sons, BJP MP Anurag Thakur and Arun Dhumal, for the service of Anurag Thakur and his brother Arun Dhumal for December 27. The Himachal Pradesh state committee of the Communist Party of India (Marxist) will launch a weeklong campaign against the Modi government’s Hindutva agenda from December 8 to December 14 in the state on the call given by the CPM central committee. The Sobha Singh Memorial Art Society in collaboration with the North Zone Cultural Centre, Ministry of Culture, will hold a six-day workshop to train 20 rural women in art and craft work, including fabric and glass painting. Art material will be provided to trainees and they will be given five prizes worth Rs 5,500 and art material worth Rs 10,000. In view of the rising cases of cattle thefts, the district police have constituted a special team named the Cattle Theft Prevention and Detection Squad under the supervision of the Deputy Superintendent of Police (Headquarters). Chief Minister Virbhadra Singh has said undue delay in 132 kv substation at Gaura in Kandaghat will be probed. The substation was supposed to provide dedicated power supply to the Giri Potable Water scheme. The water scheme was inaugurated in 2007 by the previous BJP government but work on this substation had begun in June 2010. The substation was inaugurated by the Chief Minister at Gaura village today. Addressing people at Gaura later, he said an incomplete scheme was inaugurated by a former BJP minister merely to take political mileage while nothing was done by his government to speed up its construction. He said his government, however, completed its work and this would now ensure adequate water to 114 villages and uninterrupted power supply to 1.20 lakh people from Rajgarh to Charna areas. It would also solve the problem of low voltage and reduce transmission and distribution losses. He said the state was witnessing rapid development and had initiated work which had been put on hold during the previous government, including roads, schools , health institution and other developmental scheme related to the welfare of the people. He said many schools had been closed during the previous BJP regime but the present government denotified closure of 149 schools thus benefiting the children in far-flung areas. The CM said development did not take place by airing irrelevant statements and spreading propaganda but by hard work. A lot of work had to be done for taking into hand any development project and the leaders in the Opposition should not take credit of unfinished schemes and mislead the people. Taking the Opposition BJP to task, he said they had always boycotted Vidhan Sabha sessions though they should have used the opportunity to discuss development issues in the interest of the people. He also felicitated the State Minority Finance and Development Corporation for receiving a national prize from the National Handicapped and Development Corporation for initiating various schemes for socio-economic uplift of the people. Others present included Sujan Singh Pathania, Power Minister, D R Shandil, Social Justice and Empowerment Minister, Gangu Ram Musafir, vice-chairman, State Planning Board, PC Negi, MD, HPSEB, and others. Its foundation stone was laid on November 28, 1992, by Shanta Kumar, when he was the chief minister. Since then the project had been left in the lurch. Sudhir said the funds for the project would be released to the Kangra Municipal Council soon. Meanwhile, former CM and sitting Lok Saba MP from Kangra Shanta Kumar today contributed Rs 10 lakh for the construction of Bachat Bhawan. He said he would contribute more to see this 22-year-old-project get completed. 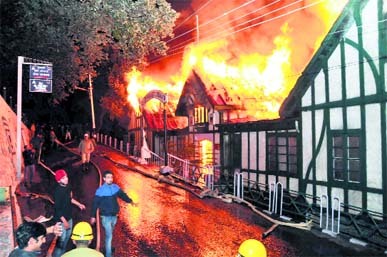 Shanta said he spoke to Sudhir Sharma, who suggested him to contribute for the project to the Kangra Municipal Council. Shanta said it was a great gesture shown by the state government and that he was thankful to Chief Minister Virbhadra Singh, Transport Minister GS Bali and Urban Development Minister Sudhir Sharma for showing keen interest in completing the project after it was highlighted by The Tribune. The story of the project was carried in these columns last week and Shanta Kumar had described the delay in construction of the project as an insult to democracy. Transport Minister GS Bali came out in support of Shanta Kumar on the issue and assured him that the project would be completed. Sudhir Sharma also assured him that the project would come up. Chief Minister Virbhadra Singh during his recent visit to Kangra had assured people that he would personally look in to the matter. 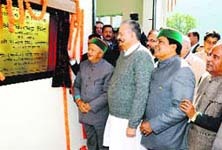 Chief Minister Virbhadra Singh today said the congestion in the IGMC, Shimla, would soon be eased as the government had identified 165 bighas of land on the outskirts of the city where both dental and nursing college would be built. Addressing delegates of the 13th annual HP State Dental Conference organised by the state chapter of the Indian Dental Association (IDA) here, he said dentistry had emerged a new medicinal science and a specialised service. He said the state government was committed to improving the health services and had opened many institutions in the remote areas where placement of doctors was being ensured. He said there was need to strengthen hospitals with the latest equipment and machinery and there was no dearth of adequate hospitals in the state. The Dental College and Hospital in Shimla was providing the best of its services and was one of the best dental colleges in the country. The Shimla Dental College and Hospital was set up in 1994 and there were only 20 seats in Bachelor of Dental Surgery (BDS) whereas today there were around 60 seats and 320 BDS seats in both government and the private dental colleges. He said under the school healthcare programme, regular dental check-up of children was being ensured and even private colleges were promoting dental hygiene. Dr Mahesh Verma, president, IDA, urged the CM to strengthen the existing infrastructure and said there was a need to open more dental hospitals and create posts of dental surgeon. He said the dental healthcare had become a challenging field where dilution of standards and unethical practices were being noticed. He exhorted the students not to adopt shortcuts in any profession. Earlier, Dr Rohit Sabhlok, organising secretary of the IDA, HP Chapter, urged the state government to ban tobacco as many cases of oral cancer were being detected in the state. World Stroke Day was observed at Indira Gandhi Medical College (IGMC) and the stress was laid on making people aware about its symptoms and the need for early detection and treatment. “Though it seemed a daunting task to be able to provide the facility of ‘’thrombolysis’’ at the district hospitals, six months down the line, 14 patients have been treated successfully and six at district hospitals,” said Vineet Chawdhry, Additional Chief Secretary (Health). He said having treatment for stroke for Himachal which has geographical constraints was very important as time factor was very important in case of stroke. What is even more appreciable is that stroke patients have been treated successfully at district hospitals, which was unimaginable before the project started. “The medicine to treat stroke patients has been made available in all 21 hospitals which have the CT scan facility free of cost,” said Dr Sudhir Sharma, Assistant Professor and Head of Neurology at Indira Gandhi Medical College (IGMC) here. He added that the cost of this medicine was about Rs 60,000 to Rs 70,000. It was due to the initiative taken by Vineet Chawdhry that the telestroke project was launched under the technical guidance of Dr Padma from AIIMS. Doctors were trained to treat patients through thrombolysis. The telemedicine facility has been used effectively so that the specialist doctors at the IGMC and Tanda hospital can guide doctors in district hospitals to treat stroke patients. Dr Sharma said stroke was proving to be the second biggest cause for death not just world over but also in India. “There is no data available for stroke patients in Himachal, but it is estimated from national statistics that the hill state should have 15,000 to 20,000 patients of stroke and 5,000 to10,000 new patients being added every year,” he said. A stroke hotline was also launched (08091077105) at the IGMC with 24x7 services to guide patients with suspicion of stroke. Stress has been laid on making people aware about stroke and its symptoms. Common symptoms are sudden appearance of deviation of face, weakness or numbness of limbs, difficulty in speaking, unsteadiness, giddiness and headache. The VC said the university had contributed significantly to making the state almost self-sufficient in food production. Despite the constant decrease in area under farming, crop yields had increased. The state has earned a name in commercial agriculture, especially vegetable cultivation. Harvests have become plentiful and the socio-economic position of the farming community has improved a lot. This has been possible due to sincere and arduous work in the university. Dr Katoch exhorted the staff to work with renewed vigour to serve the farming community and students in a better way. He drew the attention of the staff towards new emerging challenges in the area of agriculture and resolved to solve them for the benefit of farmers. He said they would ensure a constant improvement in all programmes in the university so that students were prepared to face the world with a pragmatic approach. Rattan Gautam, Registrar, Dr SP Sharma, Director of Research, Dr NK Pathania, Dean, College of Agriculture, Dr Atul, Director, Extension Education, Dr Rekha Malhotra, Dean, College of Home Science, Dr SS Kanwar, Students Welfare Officers, Dr J Shekhar, Librarian, and Er AK Chadha, Estate Officer, were also present on the occasion. Dr NK Krishna Kumar, DDG (Horticultural Science), presided over the inaugural function. Dr SK Malhotra, Horticulture Commissioner, Ministry of Agriculture and Dr Julian Parr, Regional Director, International Centre of Potato (CIP), New Delhi, were present as guest of honour, along with other dignitaries. Dr BP Singh, Director, CPRI, welcomed all dignitaries. The Governor conferred the Kaushalya Sikka Award to Dr Jeevalatha, scientist, CPRI, Shimla, and her teammates Dr Baswaraj R, Dr Ravinder Kumar, Dr SK Chakrabarty and Dr BP Singh for their outstanding contribution in the field of potato disease diagnostics. The Chandraprabha Singh Young Scientist Award was conferred on Dr Jagesh Tiwari, scientist, CPRI, Shimla. Four publications were also released on the occasion by the Governor. Virbhadra had filed three defamation cases against Dhumal and his sons alleging that the former CM and his sons had been raising insignificant personal issues relating to his income tax returns and loans in the media since the 2012 Assembly elections to gain political objectives. He alleged that Dhumal, his sons and other BJP leaders were back to their old political tactics and indulging in mud-slinging and malicious propaganda against him through the media. 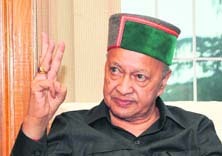 Virbhadra said they had tried to tarnish his image by making false allegations of corruption against him. The cases were listed before the CJM, Madan Kumar, and during the course of hearing the counsel for PK Dhumal filed an application for exemption from personal appearance of the former CM. The same was allowed by the court and he was exempted today from personal appearance. However, the other two cases to which the sons of Dhumal are party were listed for their service on December 27 as they were not served for today. CPM state secretariat member Tikender Panwar said the party, at a meeting held here today, decided to launch the campaign against the “right-wing offensive” fueled by the corporate-Hindutva forces. “There is a growing onslaught on people through the imposition of neo-liberal policies which is going to adversely impact the livelihood of people who are yet to get respite from price rise, unemployment and corruption,” he said. “The Hindutva forces are resorting to aggressive communal activities,” the CPM alleged. “The Modi government’s patronage of the RSS and its outfits is aimed at communalising educational, social and cultural institutions. There is rise in communal tensions in different parts of the country,” the party alleged. The issues that would be highlighted in the campaign would include the curtailment of MGNREGA, failure of the Centre in curbing price rise, controlling exorbitant price of medicines and drugs and against FDI in insurance and to take firm action to unearth black money. In the four-day workshop of dying art of courtyard and wall writing in Himachal Pradesh ‘Likhnu’, 15 rural girls will be imparted training by a master trainer. Besides art material, five prizes will be given to the participants along with certificates. The society will also organise an on-the-spot painting competition for nearly 150 students of 30 schools of the region on November 22, which will be the concluding day. 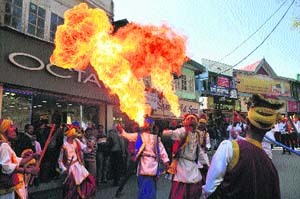 They will be given prizes worth Rs 11,000. An art quiz competition for school students has been proposed on November 22. A greeting card-making workshop for 20 children from November 19 to 22 will also be organised. Expert lectures on art, folk art and culture of Himachal Pradesh and regular slide and documentary shows for the participants and art lovers will also be organised. Besides a large number of art lovers, followers and art-students, art connoisseurs and tourists are expected to attend the art festival. Sobha Singh’s birth anniversary will also be celebrated from November 13 to 17 at Jagraon near Ludhiana and at Bathinda from November 26 to 30. The police said all cattle theft cases registered in the district would be investigated by the team on a priority basis. During the movement of shepherds, the details of cattle and accompanying party would be obtained from them at the nakas, barriers, police stations or police posts. The name and address of shepherds, type of cattle and their number, next place of stay of the shepherds etc would also be collected and lodged in the daily diaries at the respective police station. The police stations or police posts concerned would frequently patrol the place of night halt of shepherds. The exercise for the prevention and detection of cattle thefts would be strictly undertaken at the police-station level as well as the district headquarters level, the police said. He said 17 blood banks and three blood separators were working in the state presently that collected 31,927 units in 2012-13 and 35,754 units in 2013-14. In Mandi district alone, 2,582 units was collected in 2013 and 2,449 units were collected till October in 2014, he said. He said it was important to carry out awareness programmes on blood donation and people should be encouraged to donate blood. 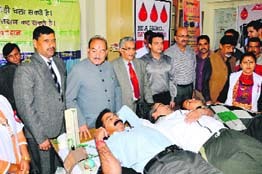 He exhorted the public to donate blood in a large number so that the life of someone could be saved. School students presented a cultural programme on social awakening.